Guys please excuse the colours, not sure what happened there. Here you are presented with the flash load after math welcome screen. Basically the navigation area runs down the right hand side. Sound, NaughtyMeter & Drive. The navigation moves to the bottom of the screen in test modes. You observe the driving experience getting more and more reckless, dangerous and stupidly funny. You have to set it naughtier after every stunt and the finale is up to us. The competition runs until the end of April and will be presented in Los Angeles early May 2010. The campaign will however only reach our screens at the end of 2010 or soon next year. The race options ... bottom left. 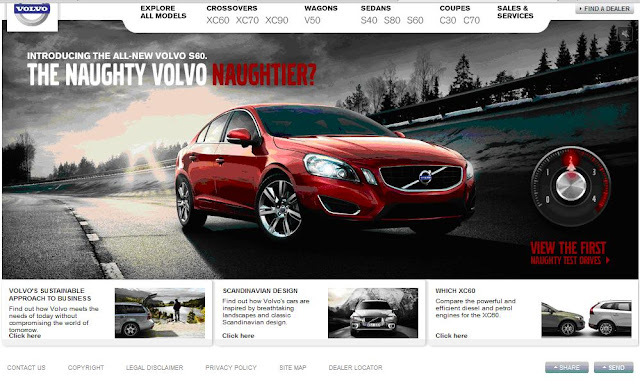 Volvo is asking unique browsers all around the globe a question. They want to know are you ready to proscribe the final level. It is still up in the air and to be chosen. Get creative if that's what you wish, or relax and wait for some awesome news. 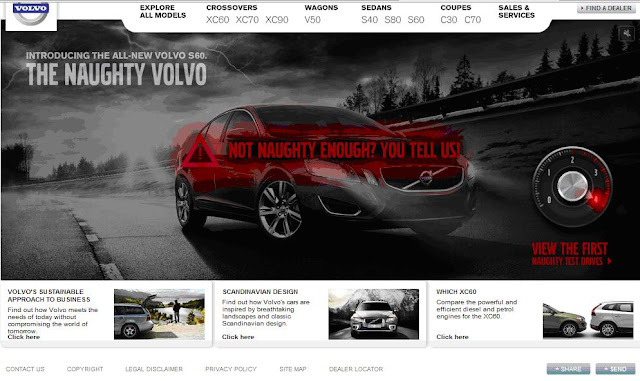 Volvo, "Not Naughty Enough? You Tell Us!" 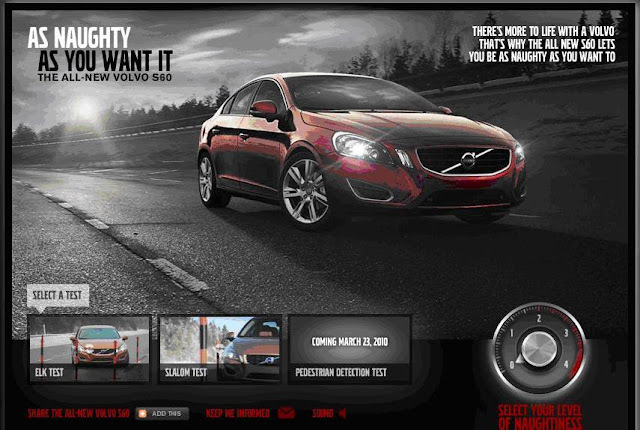 A fantastic press release from what seems to be from the Volvo team and stunt drivers. The drivers got into it, as Sven explains. "Of course we don't encourage anyone else to drive in this way. Instead, what we wanted was to show that the car can handle all this and more thanks to its superb dynamic properties and innovative technical solutions," explains Sven de Smet, campaign development manager.